This successful seminar was organised by Goodhealth's CEO Datuk Paul Chua and his assisstant Ms. Christina Kam. The turnout was good around 80 people packed the hall of Cheras International Youth Centre on this beautiful Sunday morning. It was a Q and A seminar and later we thrilled the crowd by hitting some compulsory poses. 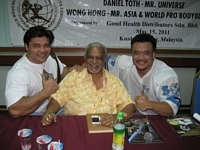 I felt like competing at the Mr Universe contest flexing with 2 of the best bodybuilders in the world, Daniel and Sazali. We also signed autographs and took many many photos with the crowd.